President Ronald Reagan was the 40th president of the United States, living in the White House for eight Christmas holidays. The Reagans decided in their first year to send White House Christmas cards that would share the “aura” of the White House at Christmastime. They wanted to encourage young artists so they would have a different artist do a representation of the White House every year and use these for their official White House Christmas cards. This produced eight varied views of the White House “aura” in its holiday regalia. This design when published required eight color separations and 65,00 Presidential Christmas cards were printed. The Reagans gave their staff a keepsake version of Jamie Wyeth’s artwork. Mrs. Reagan also gave her East Wing staff a silver-framed photograph engraved “Merry Christmas 1981, Nancy Reagan”. There were several signed photographs given to the domestic staff, and the holiday party favors featured brass tree ornaments engraved “Merry Christmas, The White House 1981”. Visitors to the White House during Christmas were treated to a plethora of old fashioned American decorations. This brought a feeling of nostalgia for simpler times with an abundance of wreaths, holly, and poinsettias. 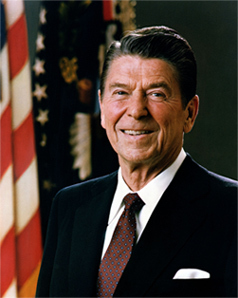 President Reagan was unable to attend the lighting of the National Christmas Tree in 1981 due to security precautions that followed warnings of another assassination attempt to come. He lit the tree by remote control from the East Room of the White House. The North Portico of the White House had a single candle flickering in a window to show solidarity with the Polish struggle. This had a strange similarity to the 1981 White House Christmas cards. The Reagans selected James Steinmeyer to create their second Presidential Christmas cards after Mrs. Reagan saw his work in House and Garden magazine. His rendering of the Red Room featured the fireplace and a detailed interpretation of the furniture, walls, and ceiling. The chandelier with its candle like lighting, the elegant drapes framing a burst of sunlight through the nearly floor to ceiling window, and the glowing fire lends an air of warmth to the formality of the furniture and paintings. A touch of Christmas greenery adds the element of holiday celebration to the room’s elegance. Steinmeyer was at the Christmas open house and was able to meet the Reagans for the first time. The First Lady expressed the pleasure she and the president received from the picture. There were 65,000 White House Christmas cards sent in 1982 and 6,000 holiday gift prints of the Red Room painting were sent with the message, “With all best wishes for a joyous Christmas and a peaceful New Year from the President and Mrs. Reagan 1982”. The President and First Fady decided to stick with the old fashioned Christmas feel for the White House decorations and for the first time Mrs. Reagan figuratively opened the doors of the White House to the people with an NBC special that featured a tour of the decorated rooms led by Mrs. Reagan along with a history of White House Christmases. President and Mrs. Reagan selected Mark Hampton out of five artists who were asked to submit samples for the official 1983 White House Christmas cards. Hampton was an interior decorator who had redone the official residence of the vice president. The official White House Christmas cards for the third year of President Reagan’s first term would show a depiction of the green room. This watercolor was appropriately titled Green Room at the White House. The simplicity of the Christmas season was brought out by placing a single wreath in the window centered in the painting. This room with its deep richness of color and furnishings is believed to be the most loved of all the White House drawing rooms. Hampton was able to capture this feeling with his finely detailed rendering of the smallest of details. The Republican National Committee paid for the 100,000 Presidential Christmas cards and plus postage that year. Every card was hand-addressed by about 400 volunteers from the Office of Presidential Inquiry. The envelopes were written in black ink without abbreviating any streets or states. White House Christmas cards that were sent to past presidents, members of the Supreme Court, the Senate, and the House of Representatives written by a professional calligrapher, Kathlyn Peake, whose work was considered an art form. There were also 7,500 holiday gift prints made of the painting. Jamie Wyeth was once again chosen to do the official White House Christmas cards in 1984. He confided in the First Lady that he didn’t have a personal interest in capturing the feeling of a room and would prefer to do an outdoor painting again. The First Lady was open to a different idea than one of the drawing rooms. While walking around the White House he saw squirrels and found that President Reagan kept a bag of acorns in his office to feed them. This proved to be inspirational for Wyeth. The 1984 White House Christmas card design was entitled Christmas Morning at the White House. The image of the North Portico topped by the American flag waving on a soft breeze exudes a feeling of peace in this oil painting. The majestic columns stand firm in their dignity at the edge of a snow covered lawn at the dawn of Christmas Day. In the shadow of the portico just visible near the entrance is a pair of Christmas trees, while the windows gaily display wreaths and garland is draped over the lantern chains. The tranquility of the scene is enhanced by the silent footprints of a squirrel as he heads for his early Christmas meal left at the White House doors. Nancy Reagan loved this painting as it reminded her that the squirrels always showed up at the White House on Monday morning as if they knew when the President had returned from Camp David. President Reagan seemed to need more White House Christmas cards every year so 125,000 cards and 7,000 gifts prints were made. With his re-election assured, President Reagan returned the nativity to the Ellipse on the White House grounds after an absence of 12 years and spoke of the nativity in his speech when lighting the National Christmas Tree. The Reagans viewed a sample of Thomas William Jones’ work, liked what they saw, and asked him to do a painting of the Blue Room for their official 1985 White House Christmas cards. Jones came to the White House to study the Blue Room from pictures taken at Christmas and to get the feel of the room. He did several sketches that curator Rex Scouten would bring back and forth to the First Lady until they all agreed on what section of the room would be incorporated in the painting. He found the enthusiasm of the staff for the Christmas decorations interesting, giving him an idea of the magical feeling of the holiday decorations. The final painting had a view of two windows hung with wreaths that allowed sunlight in to brighten the Christmas floral arrangement on a small table centered under the ornate crystal chandelier. The decorated fireplace off to the left lends a hint of hominess to an otherwise formal space. The Christmas decorations are subtle with a hint of elegance. The walls and rug have a sense of dimension that is soft and appealing to the senses. 125,000 White House Christmas cards featuring this design, entitled The Blue Room at Christmas, were printed along with 8,000 holiday gift prints. The cost to the Republican National Committee was $27,000 for printing and mailing. The President and Mrs. Reagan loved the painting so much that they had Jones do the paintings for the next three years. President and Mrs. Reagan agreed to let Thomas Jones do his own interpretation of the East Room for the 1986 White House Christmas cards. Jones wanted to paint a simpler version leaving out all the tiny details. The East Room at Christmas was a watercolor featuring soft and subtle shadings that conveyed a feeling of holiday wonder. The portrait of George Washington majestically stands as a focal point before your eye wanders to the mirror with its wreath of green above the gaily frolicking flames in the holiday fireplace. A portion of the beautifully presented tree covered in snow is reflected back from the mirror. As you pull back you realize that there are two trees with snow draped limbs on either side that bring a feeling of serenity to the painting. Once again 125,000 official White House Christmas cards were sent out and 7,200 gift prints were given by the Reagans. President Reagan’s Christmas speech included the following thought: “The greatest gift we can give each other is the gift of ourselves.” This fit in nicely with his assistants in lighting the National Christmas tree in 1986. Byron White, eight, and his “Big Brother” Francis Hutton, were representatives of the Big Brother/Big Sister organization. The State Dining Room was the featured room for the 1987 White House Christmas cards. Thomas William Jones offered two sketches of the room for approval, one was an angled view of Lincoln’s portrait and the other was a straight on view of the picture. President and Mrs. Reagan preferred the straight on view of the portrait. The artist removed the dining room table from the watercolor painting and used lights and diagonal shadows to create a deeper dimension. The wall has a softened, almost faded look with the portrait of Lincoln in stark relief above the blazing fireplace. Shadows along the floor give depth and intrigue to the floor space in the foreground. Christmas greenery is artfully draped around the portrait and on the mantle making the otherwise formal scene more festive. 125,000 Presidential Christmas cards were printed in 1987 and there were 6,600 prints made of The State Dining Room at Christmas. The tremendous job of hand addressing these cards was done by a large group of volunteers with good handwriting skills. President Reagan’s message and the lighting of the National Christmas Tree were done in early December to leave time for the summit meetings with Mikhail Gorbachev. The White House Christmas decorations were ready in all their glory to greet the State Dinner held for the Gorbachevs on December 8th. The 125,000 White House Christmas cards of 1988 were imprinted with the message, “The President and Mrs. Reagan extend to you warm wishes that your holidays and the coming year will be filled with happiness and peace.” The staff were each a lucky recipient of one of the 7,000 gift prints. The President addressed a large crowd as he lit the National Christmas Tree for the last time on December 15, 1988. Reagan considered the last Christmas in the White House bittersweet, since he would be leaving the people who were there to help him carry out his duties as President, yet he would be returning to his beloved California. He felt the staff and Nancy had made the White House a real home for the eight years he lived there. Hi, I’ve seen his work “Jamie Wyeth” a few times, most of the stuff I’ve seen has been animals, I think I remember one where the theme was a pig which was very popular. From my understanding not only did his grandad paint but I think the whole family were accomplished artists, but I must admit I never knew he did the White House Christmas cards. But hey it’s nice to see Ronald Reagan again who in my opinion was the nicest president America has had. one thing you should know about reagan. maureen was the only child reagan had with jane wyman. she was not nancy’s child. nancy had 2 a boy and a girl with ron. I have Christmas cards that were sent to my father for sale. I have 1984, 1985, 1986, 1987 and 1988 that were sent to my father from the Reagan White House and was wondering if they have any value?